We see some outfits we expected from the get-go… others who’ve fought through tumultuous campaigns to surprise the Nation as they take a shot at top-tier balling this weekend. The National Title in a fortnight’s time is nice and all… But the reality is this weekend most likely holds the biggest prize for each of these programmes: Premiership balling in 2019! Welcome to the first UKAFL Bowl! We jest of course, but it certainly is telling that these two teams have emerged on top out of the Northern half of Division One this year considering the vast number of similarities between the two outfits! Both teams are run by business-savvy Chairmen linked to the start-up UK American Football League, an enterprise looking to, essentially, ‘upgrade the product’ that is Britball. Both teams have experienced coaching staffs with strong links to top-level University programmes. Both teams have utilised their strong links with University programmes to access international talents brought to the UK via sports scholarships programmes. We could go on. They each come into the fixture with undefeated seasons at their backs and eager to ensure they lock up top tier balling for 2019… But who’s it going to be? Well, while these two teams have their similarities, they’ve also certainly got their differences too. For the Falcons its been a fairly smooth flight so far. Even the Steelers didn’t make them sweat too much during the regular season, and Leicester eventually made short work of Lancashire last weekend – a cagey first quarter opened up in the second half as Leicester’s depth and ability to finish drives allowed them to soar out to a 44-7 second-half victory. Late-season injuries to a number of key players have passed and Leicester are coming into this one fighting fit. “I think this is a genuine 50/50 matchup between two great teams. They have some talented players but so do we. We have prepped more this year and improved our depth of talent but expanded our coaching staff too. Meanwhile, the Vikings have had a far more tumultuous route to Week Nineteen. They were pushed, hard, a couple times during the regular season and have dealt admirably with significant changes behind the scenes – including a change at the top of the coaching staff and the announcement that Club Chairman Mick Tyler would be departing at the season’s close to focus on UKAFL. 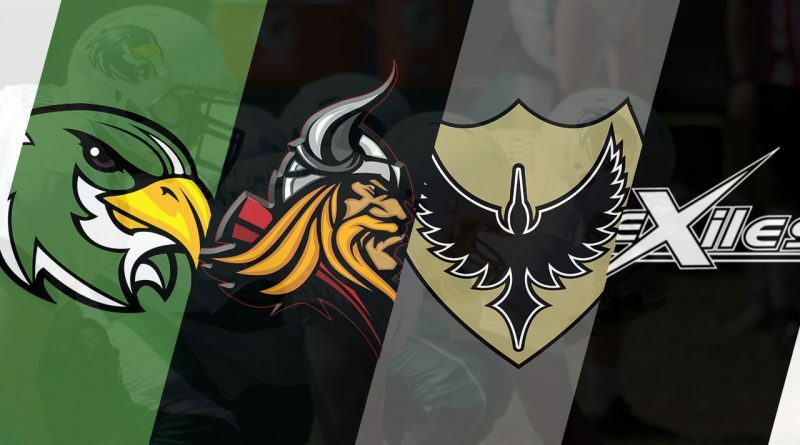 Last weekend’s game against the Sandwell Steelers has simply got to be in the running for Game of the Year as the two teams traded blows back and forth, before the Vikings eventually edged through 34-33 victors! Still, they didn’t come out of that gruelling game unscathed. #1 Wideout Diira Ejibe took a hefty hit from Sandwell Safety Greg Freeman and missed much of the game – leaving Quarterback Eric Poindexter without his favourite target. If Ejibe’s not healthy for this weekend’s game it’ll certainly leave a hole that’s hard to plug in the Northumberland offence. Both of these teams seem like they’re ready for top-tier balling… but who’ll be the last northern side standing when the dust settles? It’s not quite a clean sweep for the Falcons, our NFC 2 Central Correspondent lone-wolfing it for his local programme! And it’s a similarly heavy swing in favour of the Falcons in the community Pick’ems, Leicester lapping up 79% of the community picks. And in the south we see two sides who’ve been building to being top-tier ready for a season or two now, get a shot at Premiership football. Each side rode second-place berths into the postseason in 2017, but both came a cropper against a gotten-hot London Olympians side that went on to finish third in the Prem South this summer. Still, strong 2018 campaigns saw each hoist a conference crown in 2018, and both teams seemed to make light work of their Quarter Finals opposition. For the Exiles this will be a second straight southern title game. The Kent outfit certainly impressed against the Sussex Thunder last weekend – leaping out to a big lead and largely shutting down the Thunder offence – a more convincing victory than the Thrashers managed in their two wins over Sussex during the Regular season. However, on the flip-side Solent also made a statement with their comfortable 43-12 win over the Hornets – a side that was coming into the postseason buzzing after a 29-14 win over the Exiles to wrap up their regular season! Our most split vote of the four games, two-thirds of the team select Solent, while four think the Exiles can do one better than 2017 and earn themselves some premiership balling next year. And it’s much the same in the Britball Nation Pick’em polls: Easily our most evenly split contest the Thrashers take 58% of the vote!